My Grandma Parkes was everything a grandmother should be. She was kind, a patient teacher (I learned numerous crafts from her), cuddly and a great cake baker. She was a professional musician all her life, working as piano accompanist to my grandfather Cecil, who played the violin. I was very fortunate to have been able to spend one night a week with both my grandparents for the whole of my final year at Loreto, Mandeville Hall. Ceramics was not offered there at that time, so I went each Wednesday night to classes at Hawksburn, a short walk from Grandma and Grandpa’s home. We invariably had chops and boiled veggies for dinner. I loved it! 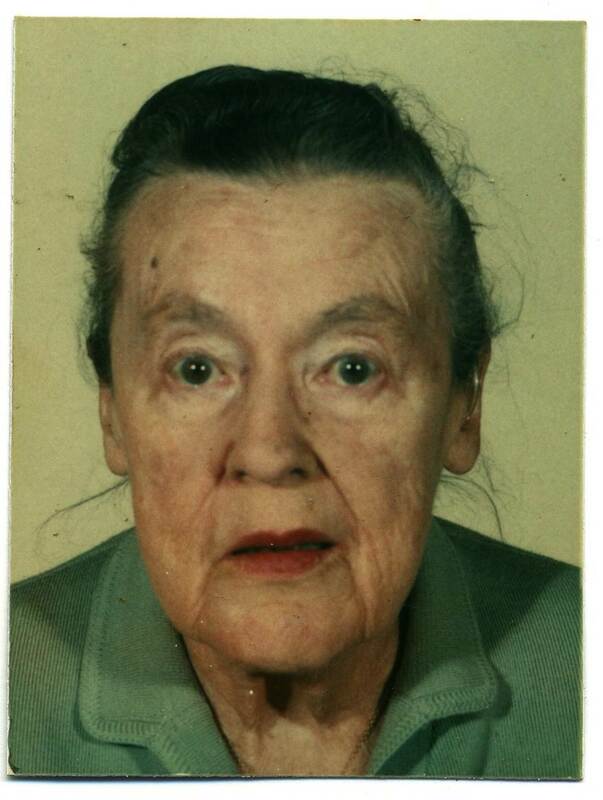 This photo of May Parkes (née Broderick) was taken in the late 1980s for a passport for a trip to New Zealand. I wish she had stepped into a photobooth more frequently as I’d love to have one or two booth pics of her as a young woman. She was a most attractive lady in her heyday. Your grandmother sounds like such a special lady. And I think I said before, but it’s always the best to have photo treasures like these when they’re the people you love. Yes, she was special. One thing I couldn’t figure out about such an independent women (as she was), is that she gave up driving when she married Grandpa in 1925. Grandpa never drove. I always wonder what happened to her Model-T Ford. I have one photo of her driving it. She looks so splendid in it! Even more amazing! You might have to sneak that Model-T Ford picture into a post! That is a good idea. I know that it is in a photo album, that is in a box, which is in a bigger box, that is in the top of a wardrobe at my Mum’s house, so it may be a while before I find it! I was thinking about putting in one or two of Grandma’s professional portraits from her younger days, too, so they could go in a post with the car..
That is just fabulous!! You made me cry when I saw that! She really was the best Grandma ever!!! Penny is thrilled to have May as her middle name! Tell Penny May that we are all thrilled, too!